Happy September! The days are getting shorter and the evenings have a slight chill to them! I love this time of year and it makes me want to start making my home cozy and inviting! 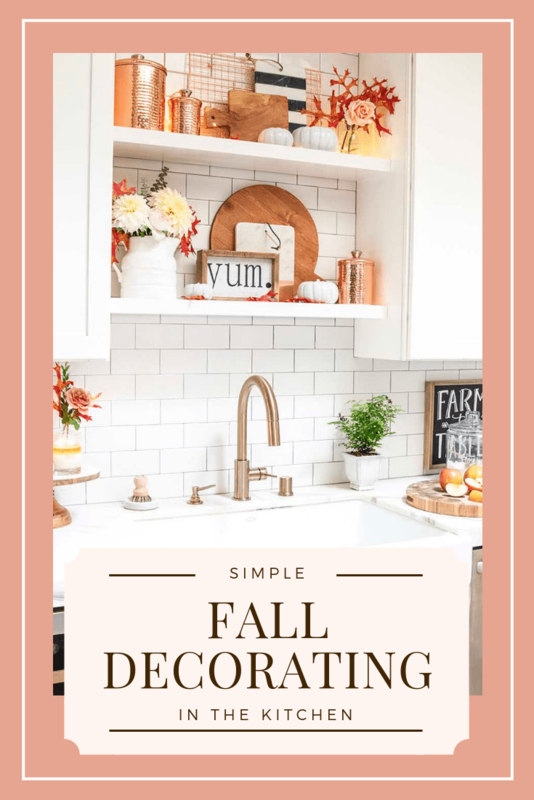 Today I want to share with you some simple fall decorating ideas for my favorite room: the kitchen! 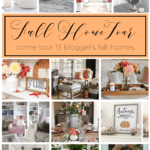 And be sure to check out all the other insanely talented bloggers that are joining me in sharing their fall decor. All linked at the bottom of this post. They say the kitchen is the heart of the home. And in that case, I think it needs to feel cozy, warm and inviting. 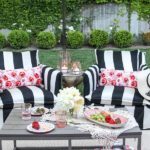 After all, where do your guests always seem to congregate when they come over? In the kitchen! 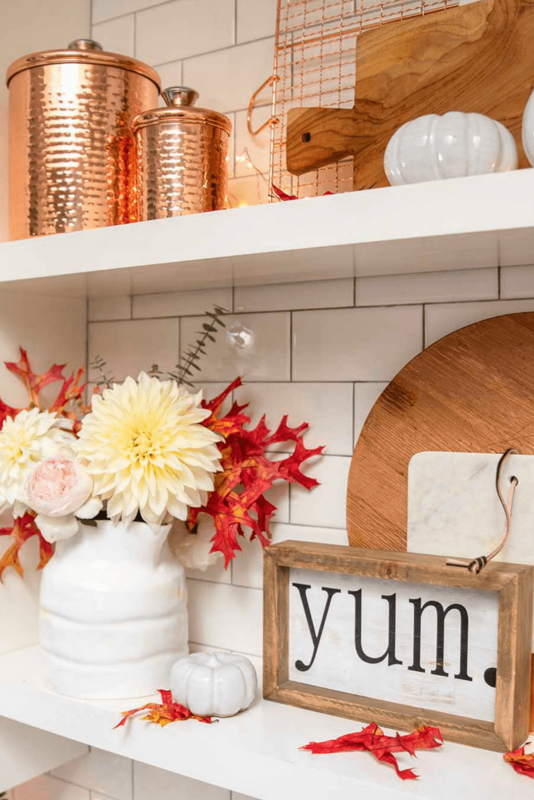 Simple Fall Decorating Ideas: Let’s Get Baking! The most surefire way of achieving a cozy kitchen is by baking. And fall and baking go hand in hand, right? 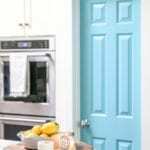 So, keep your baking essentials accessible and on hand. 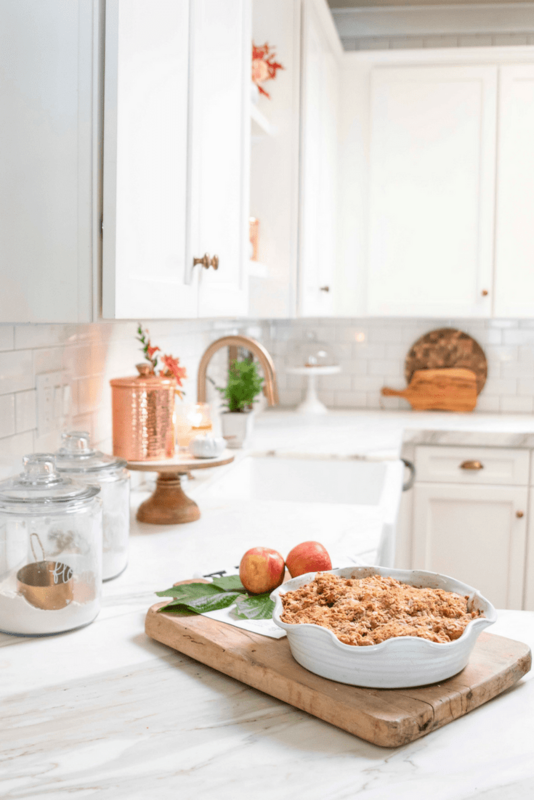 These copper jars hold flour, sugar and oatmeal so they are easily accessible to whip up a batch of pumpkin muffins or chocolate chip cookies. If you need any recipes, here a few of my favorites! I like to start my fall decorating a bit earlier than most. 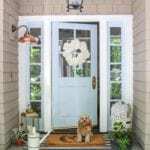 By the end of August I am itching to get out some of my fall decor and start making my home a bit cozier. So, I like to decorate in stages. I start off slow and gradually add to the decor bit by bit as we progress through the months until we hit the peak in November! Since it’s still early, I chose to decorate in pretty shades of metallics and neutrals. There are no true oranges (aside from the leaves) and I love the warmth that the copper brings to these shelves. The warm woods from the cutting boards help create that cozy vibe. Add in some neutral flowers consisting of dahlias, roses and fall leaves and you have a beautiful vignette! And I love these white ceramic pumpkins from my favorite store Farmhouse Pottery! I picked these up on our trip to Vermont last October. If you missed my travel guide to Fall in Vermont, be sure to check it out HERE. 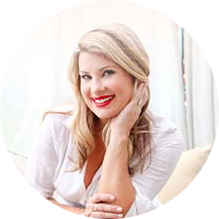 My favorite way to bring the feel of Autumn to your kitchen is through the gift of scent. You don’t have to bake an apple pie for your home to smell cozy and inviting. 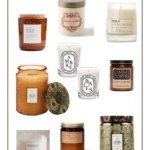 There are so many great candles that will mimic the smell of fresh baked pumpkin muffins or warm apple cider. I love to burn a few of the same scent at the same time to really fill each room with that delicious smell! 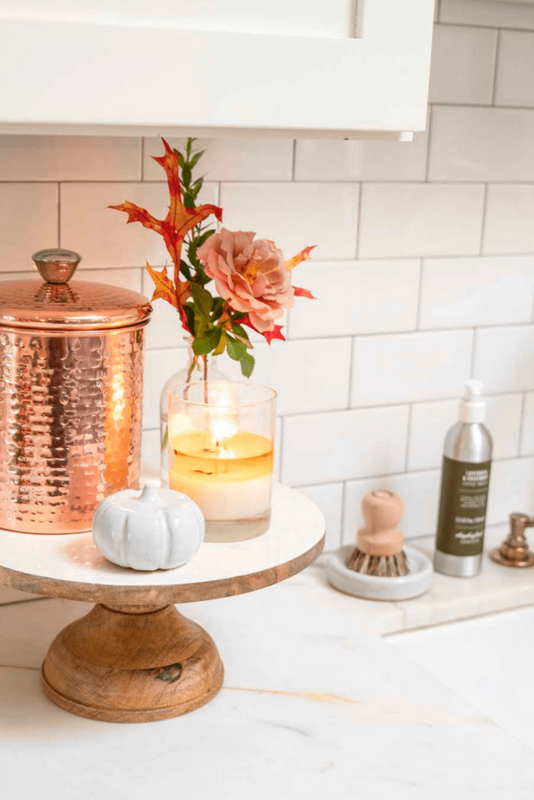 Your copper collection is so beautiful and is the perfect accent for fall. I so need a few pieces, too. 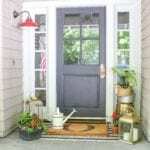 Your post is awesome and it totally looks like fall is happening over at your house! 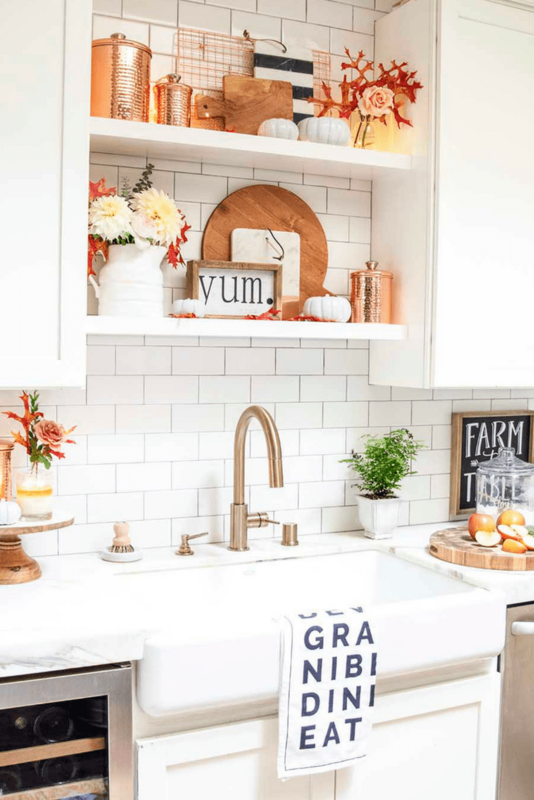 We are obsessed with your simple fall styling in your gorgeous kitchen! The metallic touches are perfection and we love a good fall candle! So excited to be on this blog hop with you! We are Always excited to see what you create next! Ashley your kitchen looks beautiful. i love the warm copper accents, and wood makes it so cozy for fall! Oh my goodness do I ever want pumpkin muffins right now. Beautiful job Ashley! Ashley your kitchen looks amazing!! 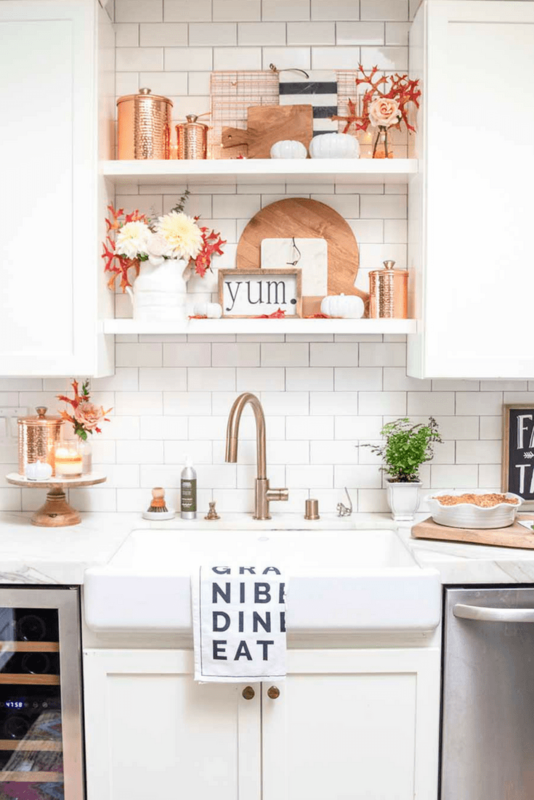 Love the copper accents 🧡 Now I’m totally in the mood for baking! I love the copper! And your recipes look fabulous. I agree with you about the candles. I love the smells of Fall and I can’t wait for pumpkin everything. Thank you for sharing your beautiful home with us! 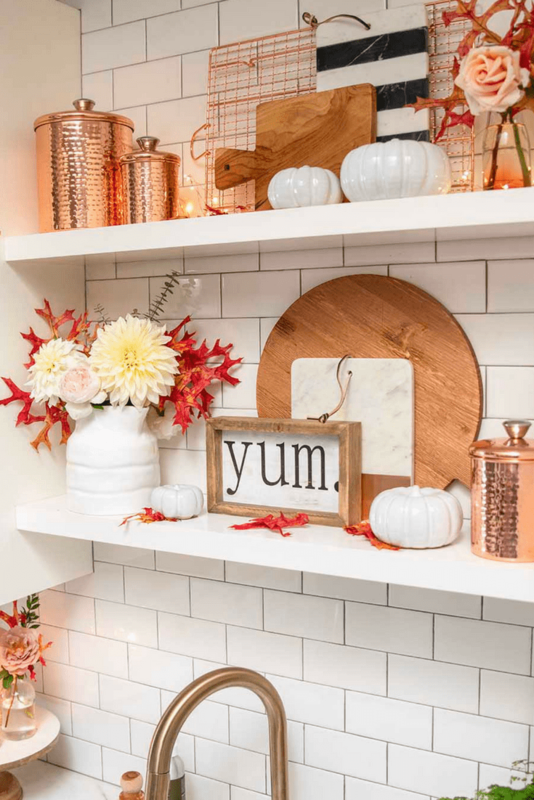 I love all of your fall touches in the kitchen! Simple yet classic! Loving all the pretty shades of metallics and neutrals. 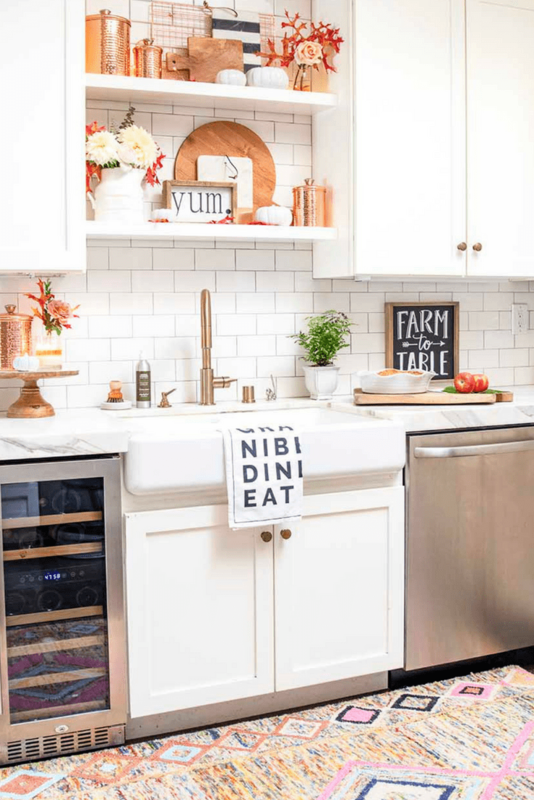 your kitchen looks so inviting!